There is no universal definition of “wellbeing”, for some people it might be feeling happy or content, or for others it may be the absence of disease. Emotional wellbeing and mental wellbeing are commonly used to describe the same thing, and are commonly accepted to include a state in which an individual is comfortable, healthy or happy; but may include broader concepts such as life satisfaction, a person’s sense of purpose, and how in control they feel. The World Health Organisation describe mental wellbeing as “a state in which an individual realises his or her own abilities, can cope with the normal stresses of life, can work productively and fruitfully, and is able to make a contribution to his or her community”. Approximately 1 in 8 Wakefield residents have below average or very low wellbeing scores. People receiving out of work benefits have significantly lower wellbeing scores than those who aren’t. Half of people who have a potential mental health disorder had low wellbeing scores. The Warwick-Edinburgh Mental Wellbeing Scale (WEMWBS) is a questionnaire which aims to assess a person’s wellbeing based on their answers to questions about their life. In 2014, a sample of Wakefield residents aged 16+ completed the WEMBS as part of a national survey on mental health. 12.5% of respondents scored below average or very low on the scale, indicating that 1 in 8 people may have health or lifestyle factors which significantly impact on their wellbeing. For information on children’s wellbeing, please visit the Emotional Wellbeing in Children page. Emotional wellbeing is intrinsically linked to mental health. Those with lower emotional wellbeing are more likely to report mental health issues and vice versa. 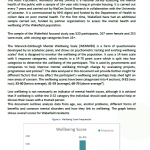 In the Wakefield sample, 53% of respondents who screened positively for a common mental health disorder (CMDs) had a wellbeing score of below average or very low. For more information on CMDs, visit the Common Mental Health Disorders page. Men were more likely to report lower wellbeing scores, with 14.3% of men reporting below average or very low compared to 10.6% of women. There were significant differences in wellbeing between younger people and those aged 45 and over in the sample. Those aged 45-54 had the lowest wellbeing scores, with 22.9% of women and 20.4% of men in this group scoring below average or very low. There is a large significant difference in the wellbeing scores of those in receipt of out of work benefits and those who were not. The WEMWBS results showed that 56.3% of people receiving some form of out-of-work benefit reported scoring below average or very low wellbeing scores, compared to 8.4% of those that don’t receive any benefits.